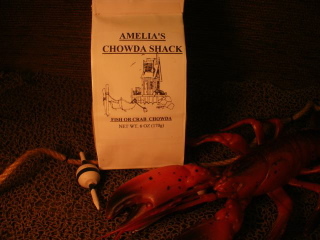 Amelia's Gourmet Fish Chowda Mix is easy to prepare and a healthy meal for the whole family. Add 4 cups of half and half to 4 cups water along with chowda mix. Bring this to a slow boil and simmer for about 20 minutes. Then add up to one pound fish (this mix can also be used as a clam chowda by using 1 can of undrained crab in place of fish). Simmer until potatoes are tender. Cooking time is about 30 to 35 minutes. Whole milk and fat free half & half may be substituted for the regular half & half. I got this chowda mix at the Big E for the first time and made it at home after trying it at the booth. What an awesome turnout!!! I put crab, salmon and oysters in mine and it was phenomenal! I was eating it for 5 days for lunch and dinner! I highly recommend this if you love seafood/chowdah.